Some atheists have little interest in de-converting religious believers or anything we might call secular activism. They do not care whether others are religious, as they are not convinced that widespread religious belief is detrimental to humanity. They just want religious believers to leave them alone, and they do not see how efforts to help people escape religious belief or promote the separation of church and state translate into their being more likely to be left alone. This post is not aimed at these atheists. I believe that we would be far more successful in our efforts if we organized and collaborated; however, I recognize that there is a great deal of resistance here. This was part of why I selected these four suggestions; these are areas where each of us can make worthwhile contributions individually. We atheists have been criticizing religious belief for some time now. This is nothing new, and it is something we have been doing exceptionally well. We criticize religious belief, religious doctrine and dogma, religious institutions, the behavior of religious believers, and more. Our criticism comes from many sources (e.g., science, history, philosophy, psychology, etc.). Countless websites, blogs, podcasts, videos, social media accounts, and books make providing this sort of criticism their primary focus. And why not? Bad ideas are supposed to be criticized in the public forum. Consider for a moment what we have accomplished. The Internet is so full of this sort of criticism that it must be fairly difficult for a religious believer to spend much time using it without encountering views contrary to his or her own. Think about how powerful that can be in sowing the seeds of doubt. Many religious believers are sheltered, explicitly discouraged from engaging with information that may be contrary to their views. Our work in this area has made it more likely that they will come in contact with this information. While few will be instantly de-converted by what they find, it can be difficult to shake off the doubts once they take hold. Also consider the religious believer who has already started to doubt his or her faith and turns to the Internet to learn more about how others have dealt with similar doubt. We have made sure that such a person will find all sorts of powerful de-conversion stories, arguments against religious belief, problems with their religious tradition, and reasons that have led others to walk away from it. Again, our work has made it far easier for them to find this sort of information. It is fairly common for people who are leaving religion behind and transitioning into atheism to go through a period - sometimes lasting several years - in which they are extremely hostile to religion and want to immerse themselves in the sort of criticism of religion they find in atheist sources. It is also fairly common for some of them to find that this interest fades a bit over time. They begin to feel like the criticism is repetitive, and they become more interested in other subjects. None of this detracts from the importance of us continuing to criticize religious belief. After all, the audience for such criticism is not seasoned atheists but religious believers and persons new to atheism. For additional thoughts on criticizing religious belief, see this follow up post. As great a job as we have done and continue to do with spreading criticism of religious belief, we have been slower to effectively promote atheism. Many atheists are doing this and doing it well, but overall, there is less of this material out there than there is criticism of religious belief. But isn't it enough to highlight the problems with religious belief? No, it isn't. If this was sufficient, there would be few religious believers left. It takes many religious believers several years to overcome a lifetime of indoctrination and accept atheism. They face many barriers along the way, including intense stigma. They know that trading in religious belief for atheism can be a costly proposition. So what do they have to gain by doing so? Living in accordance with reality might be enough for a few, but it is nowhere near sufficient for many. We need to share the many benefits of atheism and the closely related but distinct perspectives such as naturalism and humanism. Most de-conversion stories explain how liberating atheism can be. We need to do more of this. We need to articulate how our lives changed for the better when we walked away from religious belief. We need to anticipate and preemptively debunk many of the misconceptions religious believers have of atheists (e.g., that we are all depressed misanthropes who are angry at the world). Most of all, we need to provide emotionally resonant information about how we are better off without religious belief. Again, simply explaining that it is preferable to live without delusion, myth, or superstition is rarely sufficient. Some atheists are guilty of debasing emotion in their public writings. Despite my efforts to the contrary, I have certainly been guilty of this from time-to-time. This is a shame, as I know better. Humans are not completely rational decision-makers, and this includes atheists. Emotion matters. To many people, it matters a great deal more than reason. We must recognize this and learn how to effectively use emotion as well as reason in promoting atheism. For additional thoughts on promoting atheism, see this follow up post. In the United States and many other countries, atheism is thoroughly stigmatized. As we disseminate accurate information about atheism, dispel misconceptions about atheists, and publicly identify ourselves as atheists, this will change. In the meantime, it is vital that we understand that the social stigma attached to atheism is a big obstacle for many religious believers wrestling with doubt and for those in the early stages of leaving their faith behind. They will need our support. Some of the support we need to be prepared to provide is tangible. Atheist teenagers are still being kicked out of their family homes for disclosing their atheism. They will need housing and financial assistance. Many more atheists will need social and emotional support. Coming out as an atheist can have serious social and occupational consequences, placing considerable stress on the new atheist. Support in the form of affordable mental health services is important, as are opportunities for social interaction with like-minded persons. Many recent atheists who were formerly religious believers are going to miss the many social opportunities provided by religion. Just because you or I might not have much interest in contrived social gatherings with other atheists does not mean we should not support them. Having these opportunities available is vital to many people. An evangelical fundamentalist Christian here in Mississippi who walks away from religion is going to experience the most severe shock I can imagine, as he or she will likely lose 100% of his or her social world overnight. Some have taken this step, but is it any wonder why many more are reluctant to do so? If we really want to erode religious influence in places like this, we need to be ready and willing to support each other. For additional thoughts on supporting atheists, see this follow up post. One of the themes I have seen in many de-conversion stories, including my own, is that repeated observations of hypocrisy among one's fellow religious believers raised doubts. Hypocrisy is something we notice. Consider how fond we atheists are of asking religious liberals and moderates why they do not repudiate the religious extremists among them. Consider how many prominent atheist authors have made the point that the religious liberals and moderates are enabling the extremists to do what they do by not repudiating them. We tend to perceive this as a form of hypocrisy, and we certainly find it relevant. 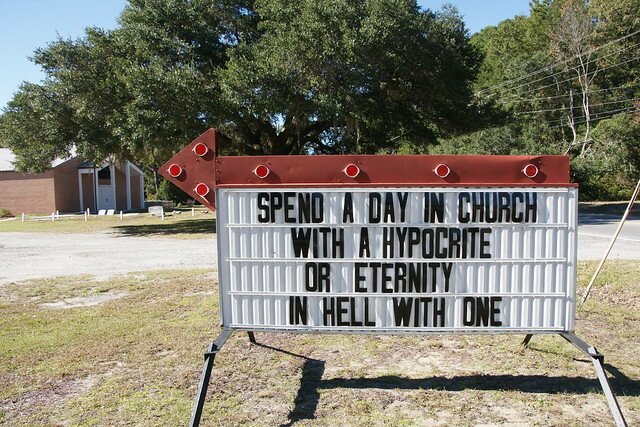 How good are we atheists at confronting our own hypocrisy? How effective are we at repudiating some of the destructive ideas that have arisen in our own community? If the answer is "not very," then ask yourself how this makes us look to religious believers wrestling with doubt. Does it make us more appealing or less appealing? In the last six months or so, I have encountered more than a few atheists online who went so far as to say that they no longer identify themselves as atheists because they do not want to be associated with the garbage they have seen coming from other atheists online. They refer to the divisive infighting, the lack of skepticism, the petty name calling, the behavior of the atheist social justice warriors, and the like. So dissatisfied have they been with what they have seen from other atheists that they've walked away from our community. They are no longer doing any of the things this post advocates or any of the forms of secular activism many of us would like to see. They have checked out. I do not know whether it would have made a difference to them to see more atheists confronting hypocrisy among atheists or repudiating some of this behavior. But I have been told on multiple occasions that the "last straw" was when it became clear that the more prominent voices were largely ignoring the bad apples. If we are going to continue to point to hypocrisy among religious believers in our criticism of religious belief, it seems like we might need to take a look at ourselves. And if we are going to keep accusing religious moderates of not repudiating the behavior of religious extremists, it seems like we might need to be more willing to address some of what is happening in the atheist community. For additional thoughts on confronting hypocrisy and repudiating bad behavior, see this follow up post.